What grades do you offer and what is the school calendar? 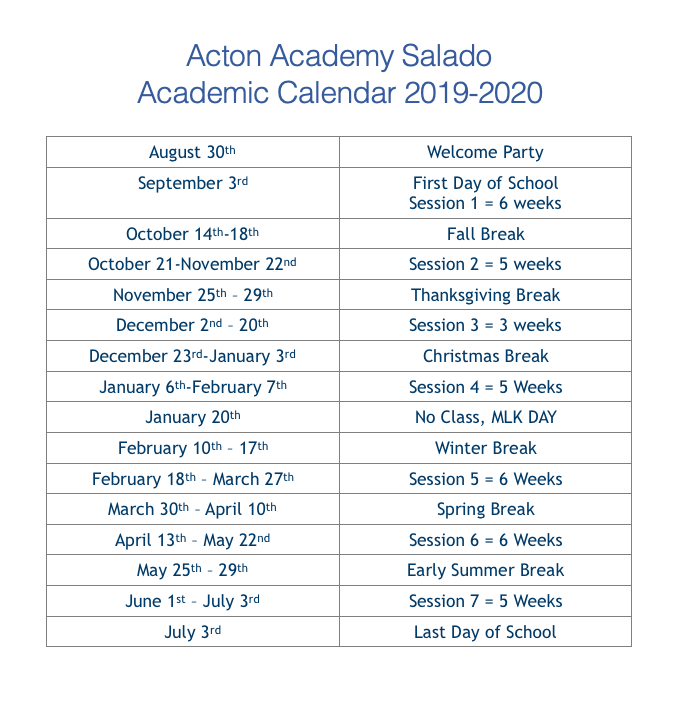 Acton Imprimis Salado will host a Prek-Kindergarten Studio, Elementary Studio, and Middle School Studio for the 2019-2020 school year and will open a High School Studio in the Fall of 2021. Find our school calendar below. The total cost of having a child attend Acton Imprimis Salado is $7,700. There is a $275 nonrefundable deposit and then eleven monthly payments of $675.00. Is Acton Imprimis Salado a Montessori school? Acton Imprimis Salado is a nondenominational Christian organization. We expose children to the importance of mindfulness, ethical principles, and the significance of religion in history and the development of society, and we value and respect each individual's beliefs. Does Acton Imprimis Salado serve special needs children? We believe that each of us has a special calling in life, and a series of trials and tests that must be faced with integrity and purpose, in order to live a satisfying and fulfilled life. Our mission is to prepare your child for his or her special journey. We believe that children learn best when working with those younger and older than themselves rather than split up into groups based solely on age. In addition to individualized curriculum, all ages of students work together in multi-age groups within each studio. At Acton Imprimis Salado we believe in learning to be and learning to do and an important part of this is encouraging kids to take responsibility for their own behavior and hold those around them to a high standard. When something isn’t working, we want our students to work together to solve the problem, not look for an adult to solve it for them. This creates a sense of independence and confidence that will serve them well in all areas of life. Is Acton Imprimis Salado accredited? At Acton Imprimis Salado, we believe in the power of balance. Using the incredible, self-paced eLearning tools now available, we are able to provide the rigor needed for learning math, vocabulary, spelling and grammar in about 90 minutes each day, while freeing up the rest of the day for engaging, project-based learning. The two are highly complementary. Don't worry! Just send us your questions to drsuzythompson@actonsalado.org or call us at 512-966-1288.